Time until Slime MoriMori Dragon Quest 3: Taikaizoku to Shippo Dan release day! 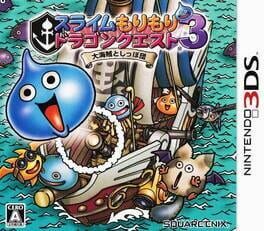 A spinoff video game to the Dragon Quest series, and the third entry in the Slime subseries. It was released in Japan for the Nintendo 3DS on November 2, 2011. The story follows Surarin, a slime, who goes on a quest to retrieve his countries prized jewels, known as "Rainbow Orbs", from a group of pirates who have stolen them.